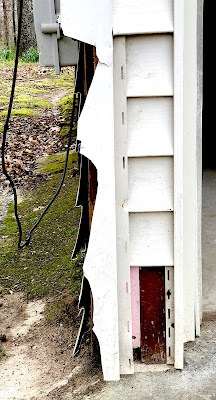 Most mornings in fair weather (often not so fair in spring and summer in Louisiana), Darrell Bourque, Louisiana’s premier poet, can be found writing the lines to a new poem while walking an old path near his home in Church Point, Louisiana. He’s a master of what poets call “voice,” often entering into the voice of some lesser-known figure who has made a significant contribution to the culture and history of his/her native state. 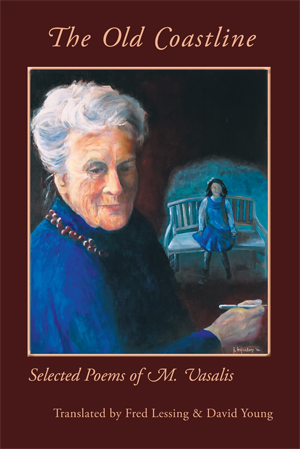 Bourque’s latest book, From the Other Side, is beautifully illustrated with the art of Bill Gingles, a Shreveport artist, and features poems about Henriette Delille, a former New Orleans religious figure. During the 19th century, Delille organized a group of devout Christian women called the Sisters of the Holy Family to nurse the sick, care for and teach indigent and illiterate Black and Creole children, as well as immigrating adults who settled in the French Quarter of New Orleans. This group was formally recognized in 1942 by St. Augustine Church in the Treme of New Orleans, and Delille, who died in 1862, was first deemed Servant of God in 1988, then advanced to Venerable in the process of canonization by the Roman Catholic Church. Her inclusion in the process continues — the next two steps are beatification and canonization. Darrell Bourque and his wife, Karen, became interested in this passionate and empathetic nun several years ago — an interest which culminated in Karen designing and rendering a glass triptych for a window of Christ the King Roman Catholic Mission Church in Bellevue near the Bourque’s home in Church Point, Louisiana. The recent publication of Darrell’s book of poetry, From the Other Side: Henriette Delille followed last month’s dedication of this window. Sorrel & Olive, Lillie & Camellia, Rose, Red & Gleem. We start with who they are & go to what they need. We let the world be the world, let the heart be heart, let creed be creed. the poor despised, the cipher bought and sold, what I saw in an orphan’s face. 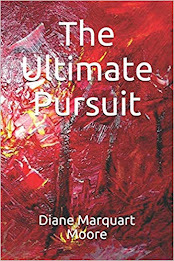 Bourque used the titles of Gingles’ paintings for all of the poems in this volume and points to the language of the paintings as influencing the language of his poems. “Without these paintings I know I could not have accessed this particular set of poems spoken by the powerful and holy human being Henriette Delille is,” he writes in the acknowledgements to From the Other Side. I would add that Bourque’s deft gift of imagining the voice within the voice (“…What’s just beyond the tree leans on what we never knew we knew…”) influences the reader’s understanding of “the other side”and the art that takes us there. Order from yellowflagpress.com or darrellbourque@gmail.com. Nobel prize winner, Shirin Ebadi of Iran, has said that in order to have understanding of and peace in the world, we must read each other’s literature. I’d add that the emissaries of that mission are translators: think of Coleman Barks translating the Persian poet Mowlavi (Rumi); Jane Kenyon translating the work of the Russian poet, Akhmatova, Stuart Friebert translating the German poet, Karl Krolow…Think also of the independent press, Pinyon Publishing in Colorado, which often publishes international poetry translations, such as its recent release: a volume of selected poetry by M. Vasalis (1909-1998), a Dutch psychiatrist who specialized in treating children and whose work has been translated by Fred Lessing and David Young. In the introduction to this volume, translators Lessing and Young emphasize that the poet Vasalis had little interest in promoting her work but that her poems “come out of her life, her experience of the natural world, her professional practice, and her family relations, arising from the press of occasion and necessity rather than from an ambition to originality or greatness…” That description alone impressed me because I admire the qualities of humility and modesty that inhere in a writer’s life mission. Vasalis’s immediacy and simplicity in “Spring,” a poem describing the spring season readers in the northern hemisphere are presently experiencing, resonated with me early in the volume and is perhaps the most whimsical one in The Old Coastline: “The light gusts across the land in spurts,/waking the hard, brief glitter/of the blue, wind-ruffled ditches and canals;/the grass lights up, dims down, goes dark./Two newborn lambs next to a grizzled sheep/stand white, printing youth’s picture against grass./I had forgotten how this was, and that/the spring is not a quiet blossoming,/dreaming softly but a violent growing,/a pure and passionate beginning,/jumping up out of a deep sleep,/and dancing away without a thought.” Although Vasalis has been likened to the American poet, Elizabeth Bishop, I hear the voice of Emily Dickinson in this selection the translators included from her first book, Parks and Deserts (1940). A reading of selections from her third book, Vistas and Visages, published posthumously in 1954, reveals more serious poetic treatments as Vasalis probes the deeper subjects of suffering and loss arising from Vasalis’s own tragic loss of a child who lived only a year and a half. The imagery in “Star” carries this message of loss in a departure from any formalism and pivots on the figure of her lost child, then concludes in a pastoral scene featuring a cow, a powerful entry into the natural world. “Tonight I saw a star for the first time./He stood alone, he did not quiver./Instantly, he pierced me through./I saw a star, he stood alone, belief/made out of light: so young and from a time/before there was such a thing as grief./The meadows lie unspoken in the light./The cows, so often painted,/restrain, with a young wet eye,/any account of their warm mystery.” That one verse , so much akin to Japanese haiku, underlines the beautiful simplicity of Vasalis’s oeuvre. In the same volume, Vistas and Visages, Vasalis reveals her love and appreciation of children and her journey as a psychiatrist dealing with youth. “Children Coming Home” evokes strong emotions in those of us who parented young offspring and welcomed them as they returned home from an all-day absence. Her description of them as “big flowers” coming out of the gathering dark, “the chilly evening air/that lightly drapes their cheeks and hair/they are so warm!” is neither Elizabeth Bishop nor Emily Dickinson but simply a mother experiencing intimacy with her young in an intense immediacy. Further, she writes: “Clasped/in the strong clamp of their soft arms/I glimpse the love, shadowless and full./ [not yet exposed to Jungian psychology about shadows that will beset them later] that lives at the bottom of their penetrating eyes,/It is not mixed with pity, which comes later,/and has its reasons — and its boundaries.” It is Vasalis who has the penetrating eyes and appears watchful about the boundaries of innocent children. In The Old Coastline (2002), readers will enjoy some of Vasalis’s poems about older relationships; i.e., a poignant characterization of her grandmother, a cherished member of the poet’s family constellation in “Old Age”: “Grandmother/snow-white-lace on/her calm sweet, white-satin head/carried when she was in Holland, at home,/the smallest muff in the whole world:/inside a tiny bottle, no bigger/than an ampule./ There was just room/for her hands. Plus one child's hand,/oh, what a delicious nest of fur and/the very softest satin lining/…Her eyes were a constantly changing blue;/you could look into them as long as you liked:/as if you were seeing, through two small openings,/the calm sea on a summer day.” That intimate tribute is both exacting and graceful, two recurring components of the selections chosen by Vasalis’s translators. This translated work by Vasalis is a powerful addition to the canon of international expression and vision.Translator Fred Lessing, a Holocaust survivor, psychotherapist, and retired professor of philosophy, retained his native Dutch language after moving to America at age 12. His fellow translator, David Young, is a poet (Field of Light and Shadow, 2010) an editor of Field magazine, Oberlin College Press, and a translator who enjoys collaborative work with his long-time friend, Fred Lessing. Thank you Gary and Susan for contributing to the mission of sharing international literature through expert translations! The Old Coastline is another occasion for celebration. Order from Pinyon Publishing, 23847 V66 Trail, Montrose, CO 81403. I never argue the fact that one picture or photograph is worth more than a thousand words. 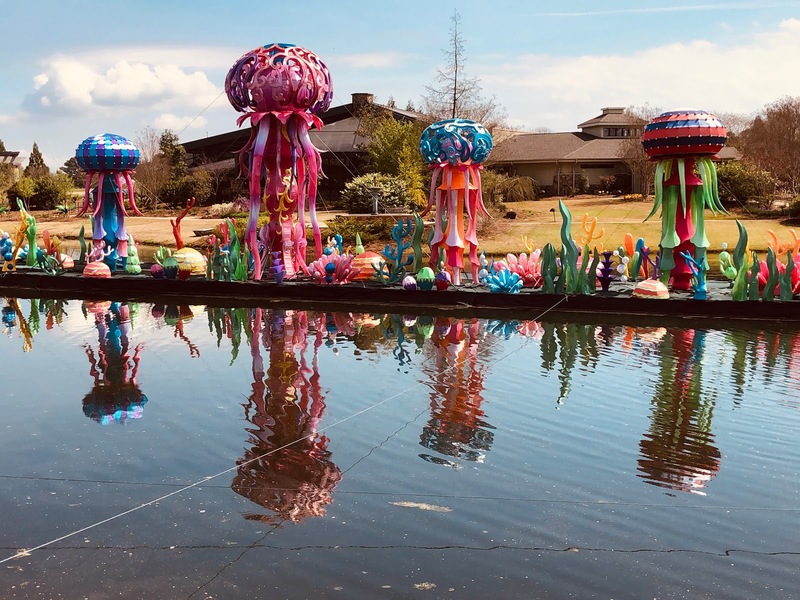 Yesterday’s walk through the Huntsville, Alabama Botanical Garden inspired me to prove that adage through the following photographs, snapped by botanist Victoria Sullivan. 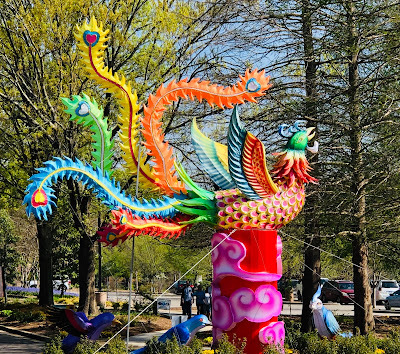 This fantastic presentation of “The Wild,” is a lantern festival produced by Hanart Culture, a company whose purpose is to present Chinese art and culture to the world. 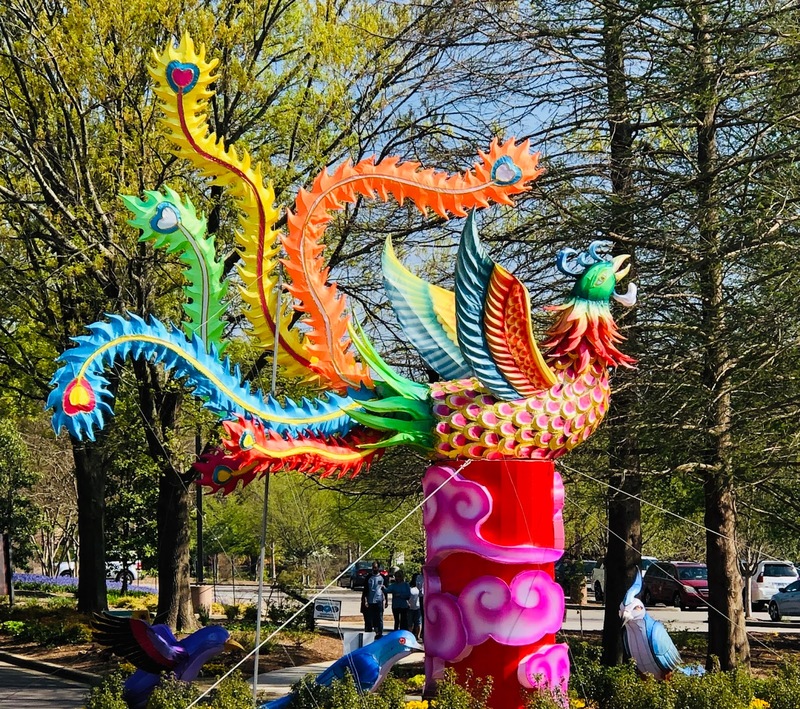 The visual production shown here focuses on the imaginative art of a traditional Chinese Festival, which falls on the first lunar month of the year, and at which time many types of lanterns decorate the streets in China. Lantern making originated with the Han Dynasty (206 B.C. to 220 A.D.). 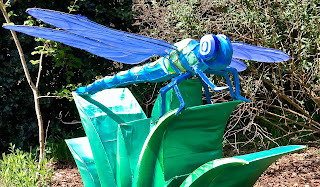 In the initial phases of this art, lanterns were only used for lighting, but they evolved into colorful art forms as seen in the Garden display. 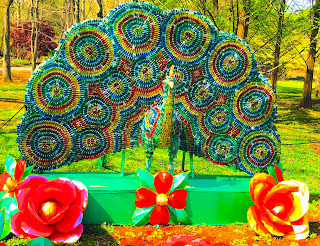 Artists utilized bottles, rags, paper, and rayon to create the art, lighting their creations with colored bulbs and moving parts. 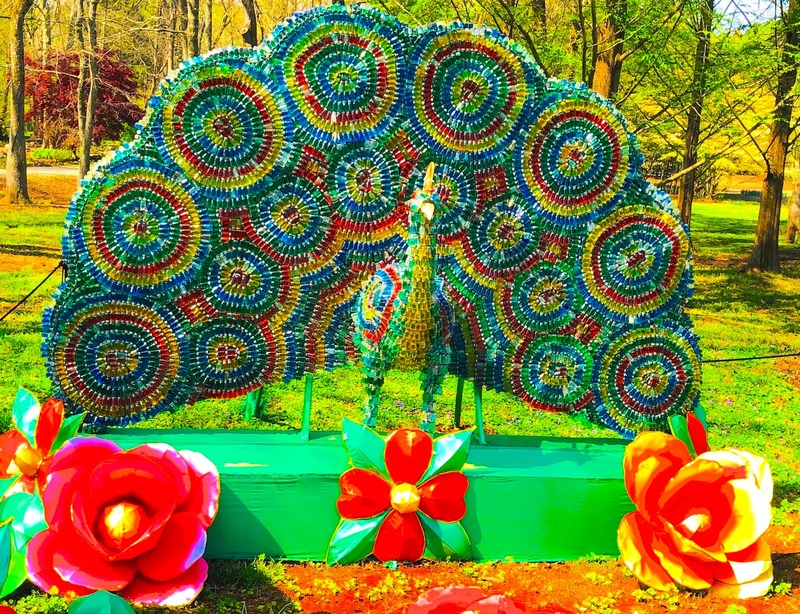 The artist of the peacock shone here created this form from colored medicine bottles. Pieces of china plates, as well as paper and silk were used to make myriad shapes and sizes of wildlife displayed throughout the park. Seventeen vignettes fascinated onlookers, “enchanting in the sunlight” and “magical in the moonlight” as the show was billed. We watched children exclaim and name the wildlife forms, and if they stayed for the nighttime show with music and sound effects (which we didn’t), they must have been further enchanted. My favorite vignette featured the peacock, but I’d have been challenged to award a prize to the most fantastic display. White birds over the grey river. Huntsville Botanical Garden has as its mission to blend traditional botanical garden elements, the aesthetic heritage of the region, the conservation of natural resources and a significant thrust into the future.This 112-acre garden also boasts of containing the nation’s largest accredited trillium collection. Someone such as naturalist Susan Hester Edmunds of New Iberia, Louisiana would find this place and its displays awesome, especially the Master Gardener’s Demonstration Garden maintained by the Master Gardeners of North Alabama. Food produced is donated to Food Bank of North Alabama.